The 2019 MLB regular season schedule starts this afternoon with all 30 MLB teams in action on Opening Day. We've got everything you need to know before the season fully gets going. Here's the Opening Day schedule -- a full slate of 15 games. Baseball fans can stream select regional games through fuboTV (Try for free). We'll get a chance to watch most of this offseason's top free agents play for their new teams on Opening Day. Bryce Harper and Manny Machado -- both broke contract records when they signed with their new teams. Harper joined the Phillies for 13-years, $330 million, while Machado agreed to a 10-year, $300 million with the Padres. Fans will also get the first official look at A.J. Pollock (Dodgers), Josh Donaldson (Braves), Yasmani Grandal (Brewers), Nelson Cruz (Twins), and Andrew McCutchen (Phillies) suited up with their new teams. The National League East became a division with four legitimate contenders after this offseason's upgrades. While this was a quiet winter for most teams, the NL East stood out for their new additions. 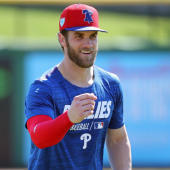 The Phillies had a "stupid" amount of money to spend this offseason so they went out and grabbed superstar slugger Bryce Harper and added four more All-Stars in Andrew McCutchen, David Robertson, J.T. Realmuto and Jean Segura. The Nationals lost Harper, but managed to stay relevant for this season with the addition of starting pitcher Patrick Corbin, catchers Yan Gomes and Kurt Suzuki, second baseman Brian Dozier and first baseman Matt Adams. The Braves tacked on a solid set of veterans (Josh Donaldson, Nick Markakis, Brian McCann) to pair with their talented, young core. Even the Mets made moves this winter, hoping that the additions of Robinson Cano, Keon Broxton, Jed Lowrie, and Wilson Ramos will add more offensive power to their lineup. The Miami Marlins' rebuild still has a long way to go before they can contend, but this division race is going to be intriguing with four potential playoff teams. Opening Day action will feature the Mets facing the Nationals and the Braves squaring off with the Phillies.